There is a serious amount of pressure involved in becoming a superhero. Comic book fans are relentless in their assassination of 'unsuitably' cast actors. Only stellar performances will win over the scrupulous paying public. So imagine being cast not only as a superhero, but an intergalactic Norse god to boot? Chris Hemsworth succeeded, and also sandwiched a stint as a womanizing, drug-abusing, 185-pound, 1970s race car driver between his two films in the role of Thor! That's a task even a genuine comic book crusader would have trouble with. Yet that is life for Hemsworth. In the past two years, his career has skipped into the Marvel universe, onto the racing track, and back again. 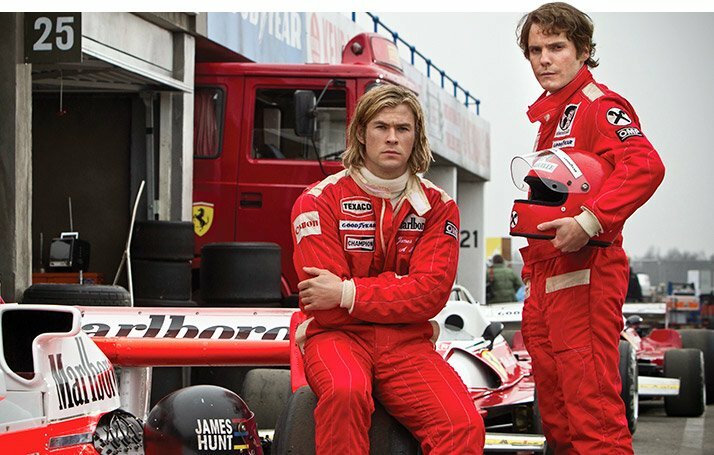 Chris shaped up to play Thor for the blockbuster "The Avengers," then slimmed down to become British Formula-1 world champion driver James Hunt for "Rush." 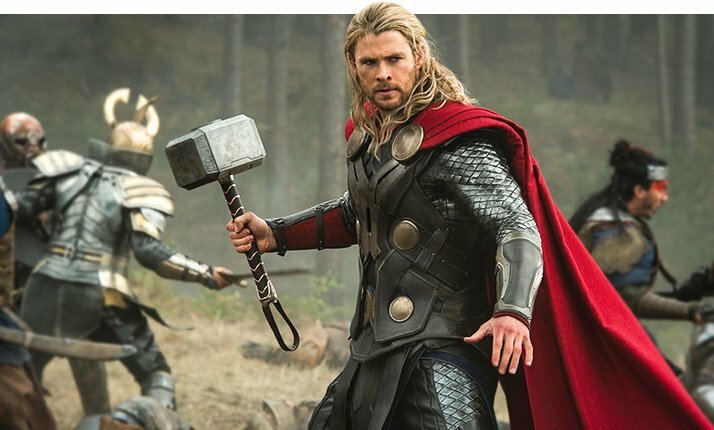 Immediately afterward, he bulked right back up again to don the red cape and wield the mighty hammer of his alter ego for "Thor: The Dark World." The God of Thunder is one of the strongest characters in the Marvel universe. To play the part, Hemsworth had to pack on 30 pounds of muscle, twice. We caught up with the Aussie action hero to find out exactly how he made his sudden transformations. Hemsworth detailed the incredible struggle he endured to cut weight for "Rush," and the strict high-protein diet that helped him pack the muscle back on again to return as Thor. He revealed the alternating exercise regimens that transformed his training schedule not once, but twice in a short period of time. Also, look below to see his Mighty Mjolnir Workout. This is how you transform into a Norse god! For athletes who cut weight for sports, the thought of dropping 30 pounds in four months isn't one they would relish; it certainly isn't a pleasant experience. Mentally, physically and emotionally draining, cutting weight is the toughest part of any athlete's training plan—ask any jockey or professional fighter. Hemsworth's sporting background is based on catching waves atop a surfboard. He has little experience in the art of cutting weight and he was tasked with slicing 30 pounds off his 6-foot-four frame to play Formula 1 cult hero James Hunt in Ron Howard's "Rush." The transformation was a battle long before he entered the pits. According to Hemsworth, the weight he shed was one of the most difficult things he's ever had to do for any of his previous acting roles. "The first thing Ron Howard said to me when I got the 'Rush' job was, 'I don't know if Thor is going to fit into a race car,'" Hemsworth recalls, chuckling at the memory. "I was filming 'The Avengers' when I got the call for 'Rush,' so I went from 215 pounds, which is how much I weigh when I'm playing Thor, down to about 185 pounds to be able to fit into the car. That was all in about four months." "I immediately went from weightlifting into cardio training to shed that extra 30 pounds, which was a pretty nasty thing to do. I'd rather put on weight any time. I was basically underfed and overtrained for a number of months—and it was still a squeeze to get into the Formula 1 car." 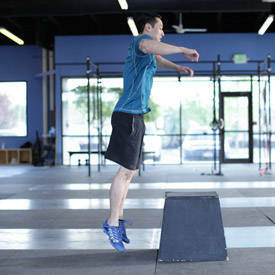 Chris quickly put aside his weightlifting regimen and a new cardio-based training schedule took its place. Thus, Hemsworth had the conditioning aspect of his weight-cut firmly in place. As difficult as the constant cardio regimen was, Chris insists that living on a strict diet for four months before filming began was easily the more difficult task. Hemsworth's cut to 185 pounds was commendable, but Formula-1 driver James Hunt actually weighed 175 pounds. Hunt (6-1) was three inches shorter than Hemsworth (6-4). No F1 driver has ever been as tall as the Aussie. Hemsworth says: "I had to burn the muscle off and I had such a limited time in which to do it. It was pretty brutal. I was basically on a calorie deficit and I took away the heavy weights. I had to mainly get rid of muscle because I didn't really have much body fat on me after 'The Avengers.'" "I ate very little protein and carbohydrates, lots of vegetables. And then I'd just run to sweat it off. I was filming 'The Avengers' when I got the call for 'Rush,' and so I sweated off the weight with a lot of running—long-distance running. It was a pretty moody existence to be honest, and I can imagine it was a moody existence for everyone around me." "I drank a ton of water as well. I'd definitely recommend that to people who are cutting weigh. It fills you up ... to a degree. I got very scientific with the calories in and calories out." He adds with a laugh: "My wife was actually pregnant at the time of me cutting down for 'Rush' and I had more symptoms of a pregnant woman than she did. I was moody and hungry all the time, and I kind of immediately knew what it is like to be truly at the mercy of something. Honestly, food was the last thing I thought about before I went to bed and the first thing I thought about when I woke up." 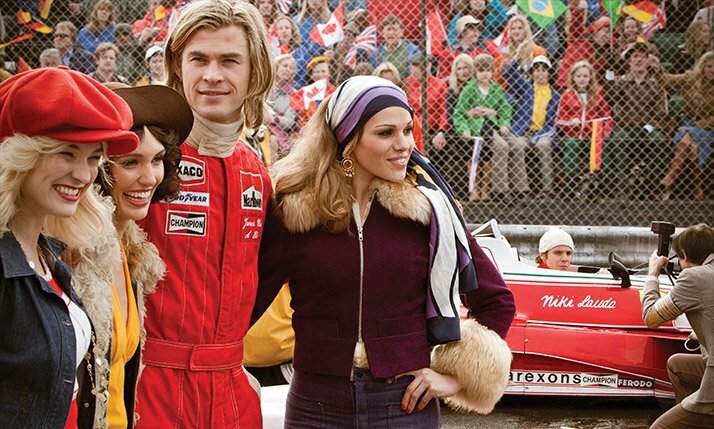 Hemsworth had to drop 30 pounds to play the role of James Hunt. This is the plan he used to cut weight to transform from a comic book superhero to a '70s racing icon. 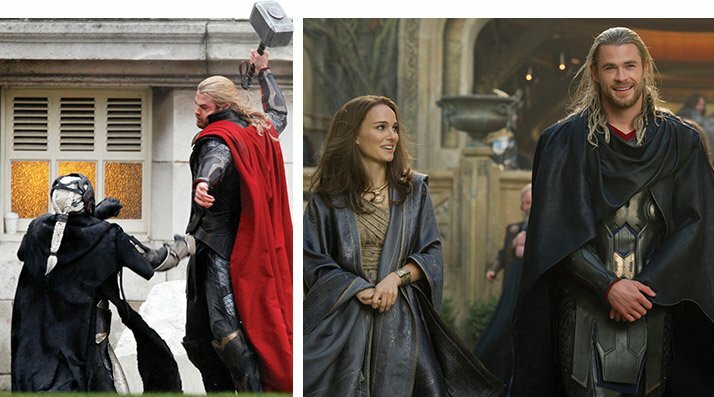 Once filming for "Rush" had finished, Hemsworth had to don the iron armor and grasp Mjolnir (Thor's mighty hammer) once again. Again he set to the task of bulking up to play the Norse god in the much-anticipated sequel to the 2011 box office hit "Thor." After shedding what little fat he still had, and stripping off well-earned muscle to fit in the race car, Chris had to re-install his superhero physique! The four-month diet he went through before was strenuous, but making sure he could once again look intimidating as the comic book superhero was just as difficult. This reversal of muscle is something most actors would struggle to pull off in such a short time frame. To help his body get back to where it was before he began shooting "Rush," Hemsworth adhered to a stringent protein-packed diet most bodybuilders would be proud to down. "Nutritionally, I had to be very efficient," says the 30-year-old, who grew up in Melbourne, Australia. "I bulked up for about eight weeks and then slowly cut down for maybe a month or so. I had to be pretty strategic with food: Eat for value. When I was cutting I would sometimes replace brown rice with quinoa. They were my staples." "It was buckets of protein, brown rice, vegetables—I mean really large quantities and I ate regularly, every three hours. It was lots of weightlifting as well, to get the muscle back from playing James Hunt in "Rush"—good old-fashioned Arnold Schwarzenegger bodybuilding stuff." Hemsworth adds: "Then I ate fruit and vegetables to help break down the protein, and a lot of broccoli. And with eating regularly, sometimes you're eating when you're not hungry and taking in that amount of food can be exhausting—but I much preferred it than my "Rush" diet." Chris Hemsworth is a 6-foot-4 Australian-born actor most notable for playing Marvel Studios superhero Thor in movies of the same name and in The Avengers. According to box office records, his first eight films generated more than $1 billion gross worldwide. Do you want to become a Norse god? Here's an example of Chris Hemsworth's daily diet plan that helped him gain 30 pounds of muscle to become Thor. By sizing up considerably through his diet, Hemsworth was able to lay the foundation for the role of Thor. However, to completely transform, the actor had to undergo a rigorous training schedule that helped him pile on the muscle. To defeat the villain and save his lady, Thor (Hemsworth) trained with martial arts, CrossFit, boxing, kettlebells, plyometrics, and more. 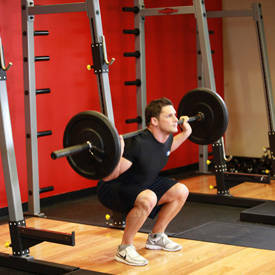 "I did do a lot of functional training. I would do circuits and bodyweight exercises for more functional strength: stuff like chin-ups and pull-ups and box jumps, and even some CrossFit stuff. I also worked with kettlebells. Man, that's intense. 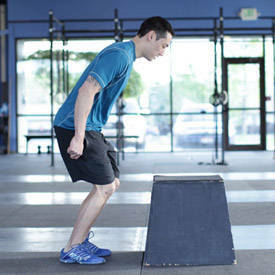 They're basically a combination of cardio and weightlifting, and they're a great way to build functional strength. I did a lot of Muay Thai and boxing. That stuff was just so I was agile and could do the fight scenes, basically so I'm not a stiff block. It was very important to mix up my weight exercises with Muay Thai and boxing. "I spent a lot of time in the gym. I had to work out for an hour or two every day and eat ridiculous amounts of protein. And closer to the shoot I was pretty much carb-free." While most people find going to the gym a chore, Hemsworth has to keep himself in athletic shape all year round. He has to be able to perform all of the physically demanding roles he is cast for. He's not only had to appreciate working out in the gym, he's even had to grow to love it. Hemsworth explains: "I enjoy training now. I think it gives me more energy and I just generally feel better about myself. When it comes to what exercises I enjoy doing most, I would probably say the bread and butter weight training: stuff like squats, bench press, shoulder press, and even deadlifts. As an Aussie, I love to surf as well. But playing Thor, it is only right that I say hammer curl as well, right? Yeah, hammer curl!" Most actors choose to leave the stunt work to their more experienced stunt doubles for fear of potentially hurting themselves and having to leave the set. Hemsworth tries to do as many stunts as he can with his own body so the movie can look as realistic as possible. The high-speed drama that came with filming "Rush" would be enough to make any adrenaline junkie's toes tap, but Hemsworth's work on "Thor: The Dark World" required a different, more pugilistic manner of preparation. "For Thor: The Dark World, I did a lot of Muay Thai and boxing," he says. "That stuff was just so I was agile and could do the fight scenes, basically so I'm not a stiff block. So it was very important to mix up my weight exercises with Muay Thai and boxing." "To play the character, especially in "Thor: The Dark World," there's a lot of wire work, fight sequences and stunt work, so the functional exercises helped with that along with my strength as a whole. But I still needed to be agile. And so it's always good to change it up and shock your muscles." 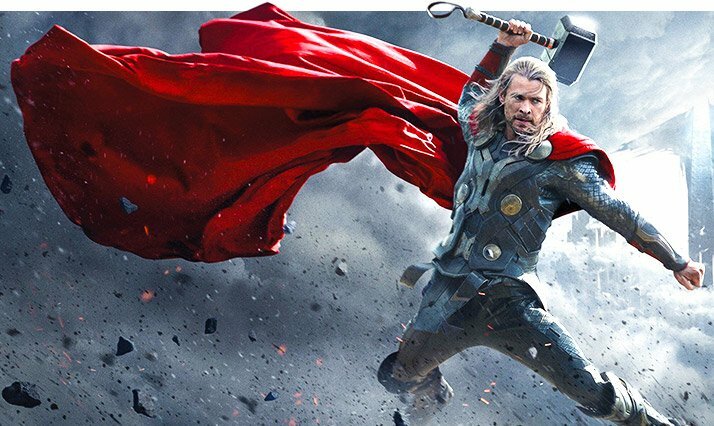 With filming now long finished and "Thor: The Dark World" a clear runaway success at the box office, Hemsworth's adoring fans are already anticipating the next time they'll be able to see the Aussie as the God of Thunder. Sadly they'll have to wait until the summer of 2015 when the sequel to "The Avengers" is released on screens worldwide. Until then, expect Hemsworth to keep up his extensive workout regimen so he can join Earth's mightiest heroes once again. 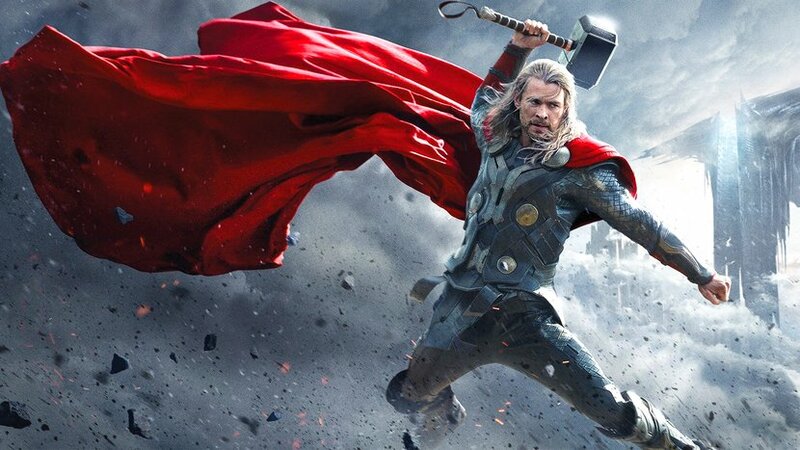 Thor's hammer, Mjolnir, or "The Grinder," is the source of much of his power. This workout may not give you the strength to wield the greatest weapon in the Marvel universe, but it can help you look like a Norse god. 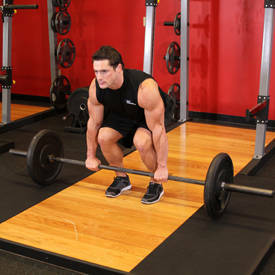 PROGRAM: Perform 6-8 reps for as many sets as you can on each exercise for up to six minutes. Rest for one minute and then repeat for another two rounds. TIP: Perfect your techniques before increasing weight as there's a lot of rotational movement involved in the workout. Hit a big tire while holding a heavy hammer in both hands. 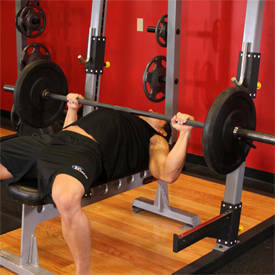 It's great for overall conditioning; it will also improve the rotational strength in your shoulders and arms. Alternate sides so both arms get work. This will develop your hand, wrist, and shoulder stability, as well as your strength. 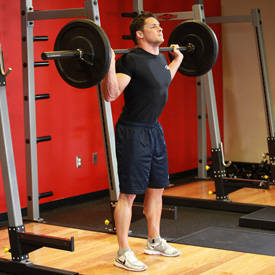 Use a lighter hammer than the 2-hand slams, and alternate arms. 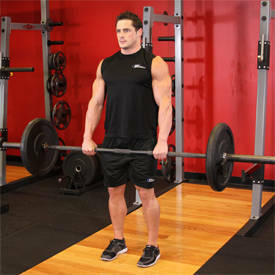 Gripping the lighter hammer with one hand, twist it behind your back before lifting it vertically; use just your triceps and slam it down on a tire; alternate arms. Swing the hammer at a big tire as though playing the ninth hole on a golf course. This will hit the hips and core while strengthening your mid section. Alternate from side to side. Hold a hammer in one hand, and then cast it around your opposite shoulder and behind your head, taking it back to the upright position; alternate arms. Grab the hammer with both hands and bring it back over your head before chopping down on a tire while bending at the knees. Perform this drill with a heavy hammer. Bring the hammer from over your shoulder while dipping and perform a front lever with it. Bring it back vertically behind your head. Repeat without pausing and alternate. Check out our interview with Thor's war-goddess sidekick Sif, played by Jaimie Alexander. 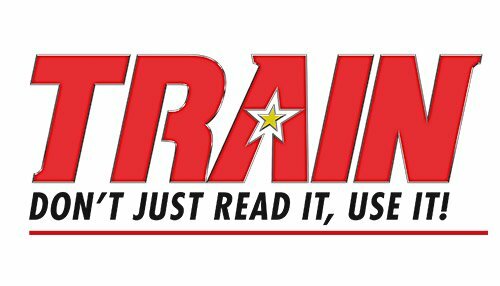 THIS NEW MUSCLE MAG IS FULL OF WORKOUTS, RESEARCH, RECIPES, AND ALL YOU NEED TO TRAIN BODY AND MIND! (ALSO AVAILABLE ON ALL MAJOR NEWSTANDS, BOOKSTORES AND DIGITALLY ON THE IPAD AND KINDLE)Go Now!